Just the word Maserati sounds cool. So where is the proper place to rest your Maserati when not on the road? That is what Maserati’s latest contest intends to find out. Their Design Driven garage contest, in collaboration with Architectural Digest, does just that by getting people to submit their garage photos and dream garage concept designs. I love the concept; get people to showcase their automotive shrine. Prior to the recent housing bust, garage design was taking on new heights and some really cool spaces were being built. The assumption is that true automotive enthusiasts, with Maserati bank accounts, will design or have built some fabulous homes for their automotive passion. Fortunately, some of the owners found out about the contest and shared their auto residences online. 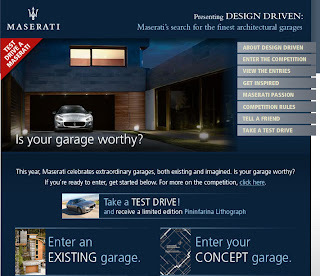 The winning existing garage will be photographed in an upcoming feature ad for Maserati in the October 2009 “Architecture Issue” of Architectural Digest. The winning concept garage will be “envisioned as an architectural model” that will go on tour across Maserati dealerships. Unfortunately, the website design team missed some key elements to make the site a showcase and give contestants the tools to promote their entry. The biggest issue is that the contest is a voting contest where visitors can vote for a garage or garages they like best. Oddly, someone failed to allow for a direct web address to vote for or see a particular garage. So, when you tell others about your garage being on the site, they have to hunt for it using a few limited sorting methods, like highest ranked or newest entry. You can’t simply say, vote for my garage at a particular hyperlink that brings others directly to your garage. Of course, this could be intentional as the contest team wanted voters to vote for what they like, not what they were told to vote for by a contestant promoting his/her entry. I found this issue particularly annoying once I uploaded my own auto shrine. 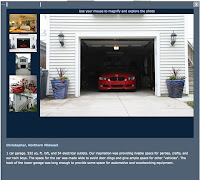 There was no way to post the garage entry to my social network or even have a direct link to share it with friends. Instead, I had to explain how others could find my garage to vote for it. Clumsy. And who wants to feel clumsy when promoting Maserati. Contest entries finalized on June 1 with voting ongoing through June 12. So, if you get a chance checkout entry #0162 (provided you can find it) and give me a vote if you wish. I’d love to see a photo shoot happen at my shrine. Quickgarage is a source for your portable garage, motorcycle covers and other applications of high quality tension fabric buildings.